Exciting Improvements to Bus Service in Warner Center! 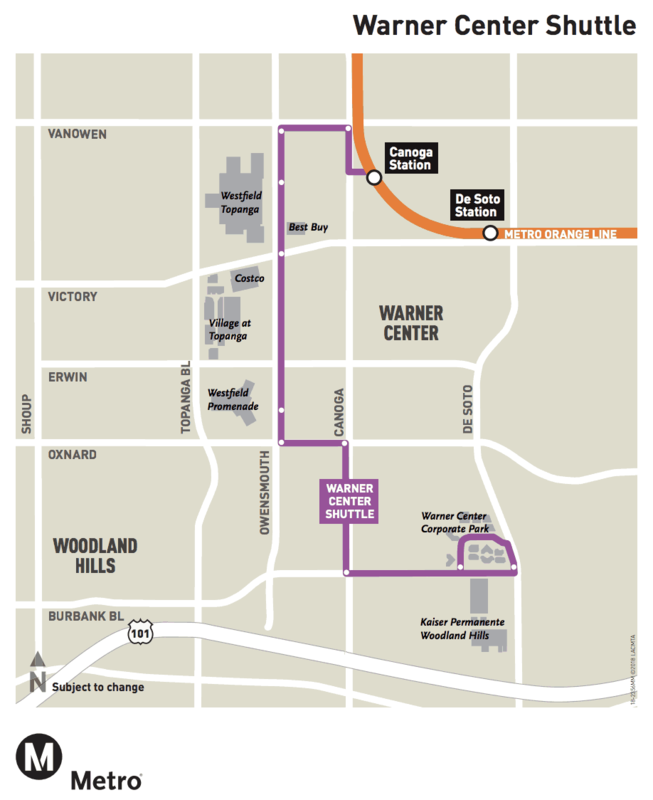 Metro Los Angeles made improvements to bus service in Warner Center beginning June 24. The new Warner Center Shuttle serves 10 new stops in and around Warner Center, seven days a week, every 10 minutes during most times of the day. Terminating the Warner Center Station, the Canoga and Chatsworth stations will serve as endpoints on the Metro Orange Line to make way for the new shuttle. Metro bus routes in the area have also been modified to provide more area access and direct connections to the Orange Line at Canoga Station. The following bus lines will be affected: Line 150, Line 161, Line 164, Line 169, Line 750. The Warner Center Shuttle makes stops at Westfield Topanga, The Village, Kaiser Permanente Woodland Hills, Warner Center Corporate Park, and much more. This allows riders to explore restaurants, shop, and hit the gym before or after work, all without the hassles of driving and parking. The Shuttle will cost the same fare as any other local ride on the Metrosystem, $1.75 one way. When using a valid TAP card, the fare includes transfers to other Metro lines for up to two hours to complete a one-way trip. This new route will offer thousands of people easy access to the Warner Center.